After Cyclone Winston blew through Fiji last weekend, 42 people were dead, and four were still missing, including an infant. The winds of Cyclone Winston reached more than 285 kilometers per hour. It was the strongest storm in Fiji's recorded history. The infant's parents told a local journalist that they lost hold of their child in the strong winds and flood waters. The child's father told Fiji One Television that his family ran from the home where they were taking shelter. He said that they were expecting powerful winds, but not the flood waters. The father said that when the winds began to rise, his family tried to run for safety and keep their 10-month-old son above water. "The water level was up to my neck," the father said. "The house began to fall and waves began to pound on us." He said they have not yet found their firstborn son. "There are Fijians out there who are without water, without a roof over their heads, without food and without essential services," said the Prime Minister of Fiji. Emergency workers faced many difficulties helping people, including power outages, fallen phone lines and road blocks. Government officials have closed schools until Monday. They plan to use the buildings as shelters for the hundreds of people who have been left homeless. The government lifted a curfew that it had put in place. However, it asked people to limit their movements as much as possible. Concerned about an increase in the number of mosquitoes, the government also asked people to not leave standing water. 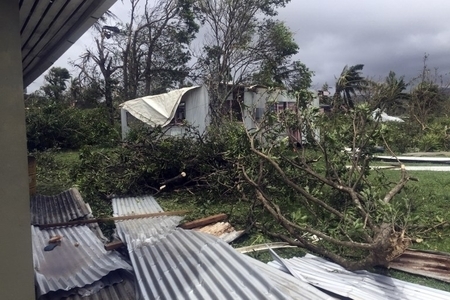 "It is likely that smaller villages across Fiji will have suffered the most, given their infrastructures would be too weak to withstand the power of a category 5 cyclone," said Alice Clements, a spokeswoman for UNICEF in the Pacific. "Families may have lost their homes and crops, therefore leaving them without shelter, food and a livelihood." Fiji, a group of more than 100 islands, is in the South Pacific Ocean. It is around 2,800 kilometers from Australia's east coast. He lost hold of the glass and broke it. Andrew has worked hard up to now. We will plan to rehabilitate the run-down neighborhood. They had a roof over their heads but not much besides. 1.Emergency workers faced many difficulties helping people, including power outages, fallen phone lines and road blocks. Major power outages are becoming a common occurrence both in Europe and North America. More power outages reported today caused by last week's meteorite strike. 2.The government lifted a curfew that it had put in place. However, it asked people to limit their movements as much as possible.